When we moved into our house, we knew that, eventually, we wanted to replace the floors downstairs. We had a mix of carpet in the family room, dining room and formal living room, engineered hardwood floors in the entry, and tile in the kitchen and powder room. Little did we know, that day of reckoning would come sooner than we thought. In March of 2016, we had a major plumbing issue. I mean, MAJOR. So bad that it was laughable (after the fact, of course). We discovered that there was a clog in our clean out pipe that was preventing grey water from the house (all dirty water from the toilets, sinks, and showers) from properly making it’s way to the city sewer. 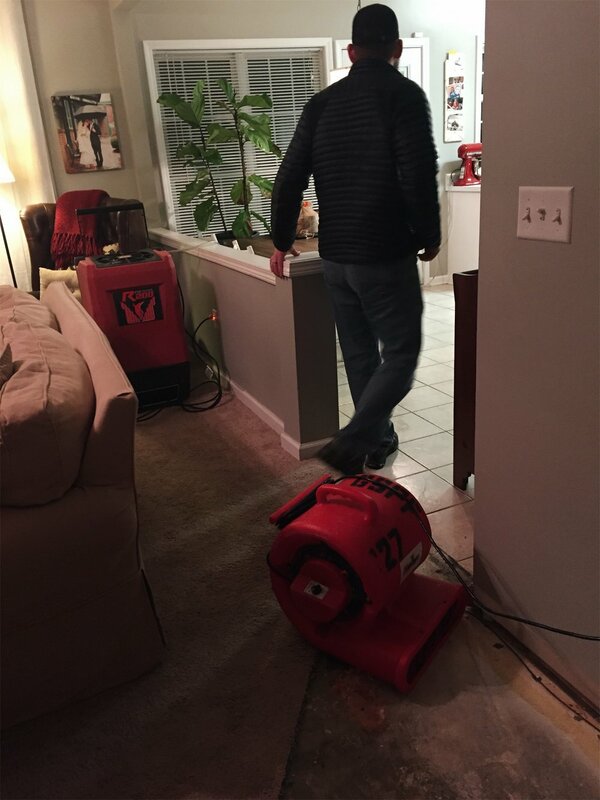 This caused a back up of water to erupt in the house and flood the floors. Seriously the worst! And seriously gross! For those of you who don’t know, the clean out pipe is the main pipe that carries all of the grey water from the house out to the city sewer lines. We have two access points: one in the front yard flower bed and one in our garage wall. We found out that when the plumbing was laid in the house 20 years ago, the correct sized pipes were not used (we're talking like a 3-inch pipe was shoved into a 5-inch pipe leaving an enormous gap that was stuffed with the plastic wrapper from roofing shingles). This allowed for tree roots to grow into the joints of the pipes which caused to the clog. Pro Tip: When you move into a home that is new to you, have a plumber come out right away to send a camera down the pipes to check for roots and other obstructions. It’s worth the money, I promise. The clog was at the lowest point in the pipe configuration. That being so, when we turned on the kitchen sink, the pressure from the clog forced grey water out the next lowest point in the house which happened to be the downstairs toilet. Sparing you all the dirty details, we had grey water damage in the bathroom, foyer, kitchen, the closet under the stairs and the living room. I ran for the linen closet and pulled down every towel I could find to absorb the water but the damage had already been done. 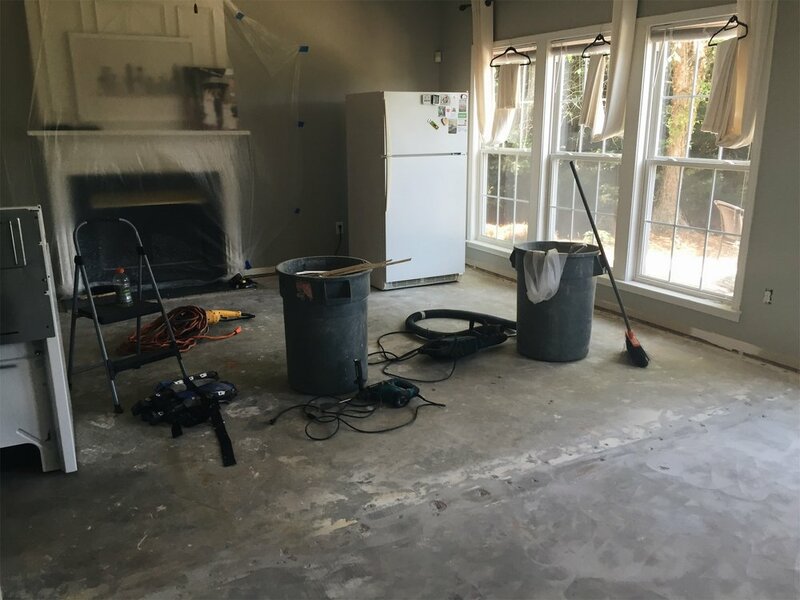 A day or two later, a demolition team came to the house and took two days to remove all of the flooring in the entire downstairs. They taped plastic sheets up over the kitchen cabinets to contain the dust, but let's be real, dust was on every.single.thing in our house. While the floors were torn up, John went ahead and knocked down the half wall that divided the living room and the kitchen using this tool. What a different it makes having that gone! Being able to completely see from the kitchen into the living room really makes this living space an open concept floor plan. 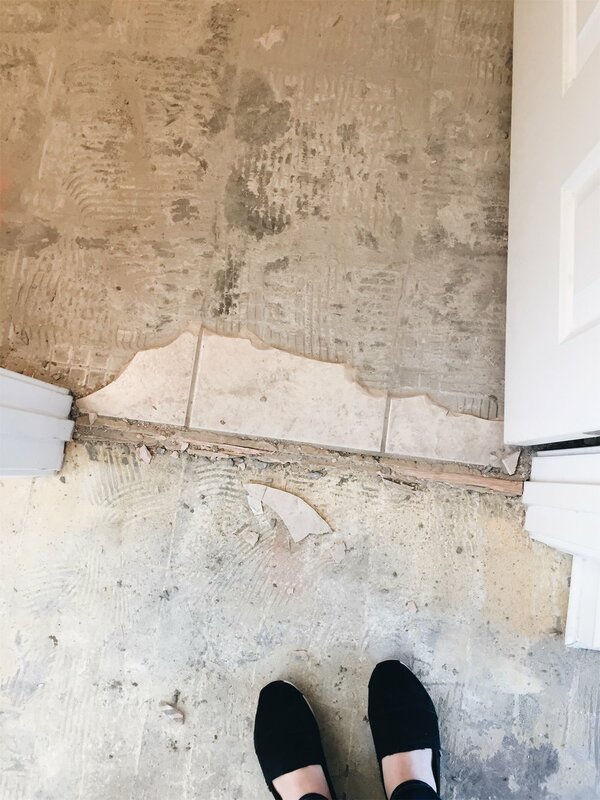 Amidst all the concrete dust that covered every inch of our home after the demo, we could finally envision the consistent flooring all throughout downstairs and what a difference it would make. After 3 months of dealing with an open insurance claim and living on a bare concrete floor, we were finally able to have our new floors installed! The crew started with making sure that the foundation did not have any dips or uneven spots. We did have a few uneven places which were fixed with a self-leveling material (similar to a super thin concrete). We went with a 9/16" x 5-1/8" pre-finished bamboo flooring made by Morning Star in the Vintage Java color. They are pet and kid friendly, high heel safe, have low VOC, and have a lifetime residential warranty. Not to mention, the walnut color we chose is a warm brown color with just the right amount of distressing. Since this project was the result of an insurance claim, we went ahead and had a crew install the floors for us. However, the super easy click-lock design makes this a great DIY project to tackle yourself! We could have totally done this ourselves. We had a crew of 4 guys lay the new floors and base boards and they were finished in about a day and a half. The thick adhesive they used acts as a moisture barrier to prevent any moisture from wicking up through the foundation. Product Review: If you have been looking into hardwood floors for your home, consider bamboo as an eco-friendly alternative to oak floors. We have been SO pleased with how our floors have handled daily abuse. They clean up great too - I use a Bona brand mop and cleaner. If I'm being completely transparent, while I LOVE the dark color, these floors do show loose dirt and grass that we track in from the yard. I have a microfiber dry mop that is super convenient to push around the house so it's really not the end of the world to sweep these floors. Sometimes, I will use my Dyson vacuum cleaner and just turn off the rotating bristles to clean the floors, too. Overall, these are fantastic floors. I love that I don't have to worry about dog toe nails denting or scratching the wood. And I have no reservations in recommending this brand on the blog. Check out their website linked here to order a sample! Thanks for reading, friends, and don’t forget to subscribe to the blog!